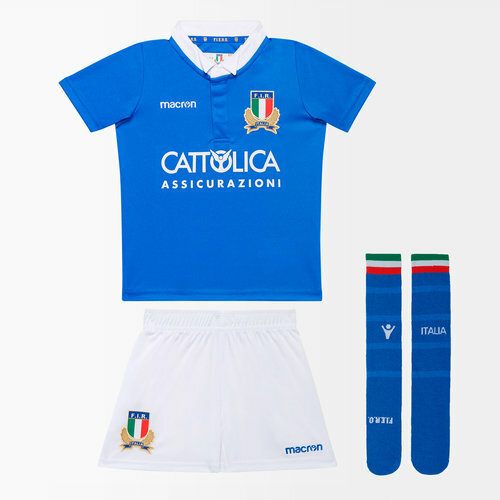 Help to show your pride for the Azzurri when you dress your child in this 18/19 Italy Home Mini Kids Replica Rugby kit from Macron. The international rugby team Italy have collaborated on this season's new kit with Macron, a partnership standing since 2017. Italy have always played in a blue jersey even though their countries traditional colours are red, white and green. Whilst their alternate shirt tends to be white which is the case with this year's jersey. The elite playing jersey was created using the latest technology available, providing Italy's squad with the utmost freedom of movement whilst they play and keeping moisture away from the body to keep the Azzurri cool on the pitch. This shirt is blue with a white collar. This shirt also uses has the colours of the Italian flag on each sleeve cuff. The Italian logo is on the left whilst the Macron logo is on the right in blue. the team's sponsor - Italian insurance company, Cattolica Assicurazioni - is across the chest. The shorts are white and also feature both the kit manufacturer brand and the country logos. The socks come in the same blue as the shirt and have the colours of the Italian flag running around the top of them.